2. Cut into piece like in picture. 3. Wrap the edge with sculpey. 5. Cut the font torso and back of the armour and attach into other armor. 6. The shoulder armor is space marine shoulder armor, can be replaced by LEGO visor or helmet (depends on peoples taste) attach the cut pieces to the armor, then when it is dry, remove the unnecessary sculpey and you get like in the picture. 7. Cut another piece from bottle lid for the front armor piece and attach to the armor like in picture, use hairdryer to speed up the process. 8. Cut a piece like in second picture if you don’t have the piece in the first picture, it is the ork shoulder armor off warhammer 40k, can be get from Ebay for few pounds. 10. Important parts: space marines accessories, can be also get from Ebay for a few pounds, then cut in pieces like in the picture. 11. Attach to the armor, the back of armor can be attached anything you like. 12. Start painting by death angel blue for base and then dry brushing by boltgun metal. 13. After few retouching with some colour layers and in details, use clear acrylic paint to protect surface, then you get the result! The metal one I use for general shaping and cutting, the ‘angle chisel’ for doing sharp lines in hair (joker, two face, my own fig etc.) and the ‘taper point’ I use to poke the hair to get the dimples where a curl is. This is pretty much how I do it, dimpling and adding depressions to join the dimples together, looking for partings/higher and lower areas etc. I also created a tool from taking the impression of the back of this hair which I press all over the smooth hair to give me some wavy impressions to start with, although this pretty much just gives a bit of texture rather than making curly hair, as you imagine it should do (possibly because it’s such a small amount to work from and it repeats too quickly). This is a great tutorial video by LegoBoyProductions on how to make Custom Minifigures using A4 Inkjet Water Slide Decal Paper. I know some of you just use printer labels, but to get a great finish Water Slide Paper is great and not that much more expensive. The video shows you where to source the minifigure decals from, how to customise them, what supplies your will need, how to prep your minifigure, and then stick the decal onto the minifigure. 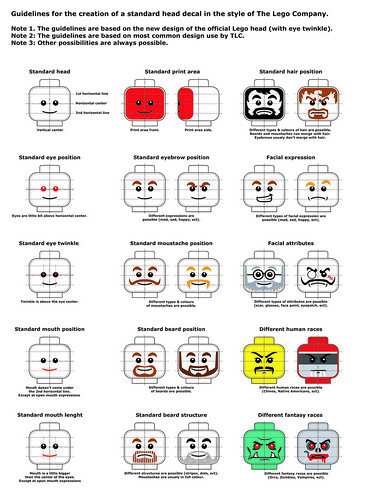 This is a really well put together guide to lego heads, its not official but seems pretty accurate, pretty useful if you plan to make your own custom Lego decals to go on custom minifigs.